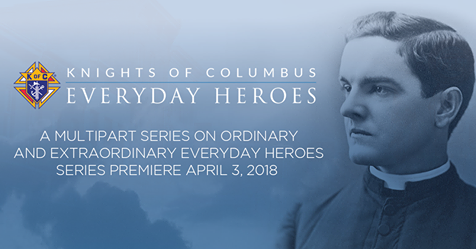 NEW HAVEN, Conn. – “Everyday Heroes,” a new nine-part online video series, highlights how ordinary men of the Knights of Columbus have made an extraordinary difference in the lives of others. The videos, which tell the stories of Knights of various ages and backgrounds, were launched online at kofceverydayheroes.org and promoted on social media from April 3 to May 29, 2018, with a new video added each week. • “Not Your Average Joe”: Joe Reali, a young man whose remarkable but short life inspired the birth of a new Knights of Columbus council that is named for him. April 3. • “A Touchdown for Life”: Knights from the University of Notre Dame who raise money for pro-life initiatives and other charities by grilling and selling steaks before Fighting Irish football games. April 10. • “Grace in the Eye of the Storm”: Jose Lebron-Sanabria, who served as a focal point of the organization’s relief efforts following last year’s Hurricane Maria in Puerto Rico. April 17. • “Going for Gold”: Chris Dooley, an active Knight of Columbus and a multisport Special Olympics athlete, reveals the triumph and heroism of athletes who give witness to the dignity of those with intellectual disabilities. April 24. • “The Singing Seminarians”: A group of young men studying for the priesthood, whose vocations are supported by the Knights of Columbus, look to evangelize through the power of song. May 1. • “Blessed Are the Persecuted”: Canadian Knights take the lead to provide sustained help to a refugee family from Syria. May 8. • “Warrior for Christ”: The men and women who take part in the Knights’ annual Warriors to Lourdes pilgrimage. May 15. • “The Heart of a Champion”: Former professional baseball player Darrell Miller’s path to faith and how it shaped how he raised his son, Darrell Jr., who is also pursuing a major league career. May 22. • “Sacrifice and Brotherhood”: James Wolf’s commitment to serving others resulted in his joining the Knights and inspiring his father to do the same. His service to his nation included giving his life as a U.S. Army soldier serving in Iraq. May 29. “Experience of a Lifetime” (running time, 10:59 min.) Video: MP4. Please consider joining our ranks. There is so much more we can do for the parish and our community with your help.